Since the time of St. Gregory the Great, formal liturgical books containing readings from Sacred Scripture have been common in the Church. Today every effort is made to assure that the Scriptures are bound in books that are "worthy, dignified, and beautiful" (Lectionary for Mass, no. 35). The Book of the Gospels is a sign of Christ’s presence in the liturgy; it is revered with the same holy kiss given to the altar. For this reason, "it is desirable that cathedrals and at least the larger, more populous parishes and the churches with a larger attendance possess a beautifully designed Book of the Gospels, separate from any other book of readings" (Lectionary for Mass, no. 36). 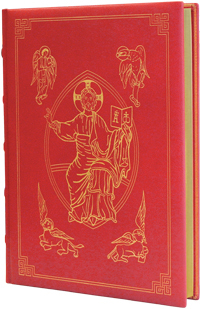 This Second Edition of the Book of the Gospels is certain to meet and keep the standards set centuries ago.